I checked another item off my 30 Before Thirty list last night! 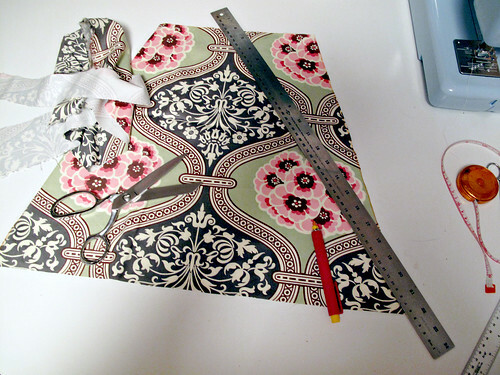 #8: Sew a dress for Eleanor. 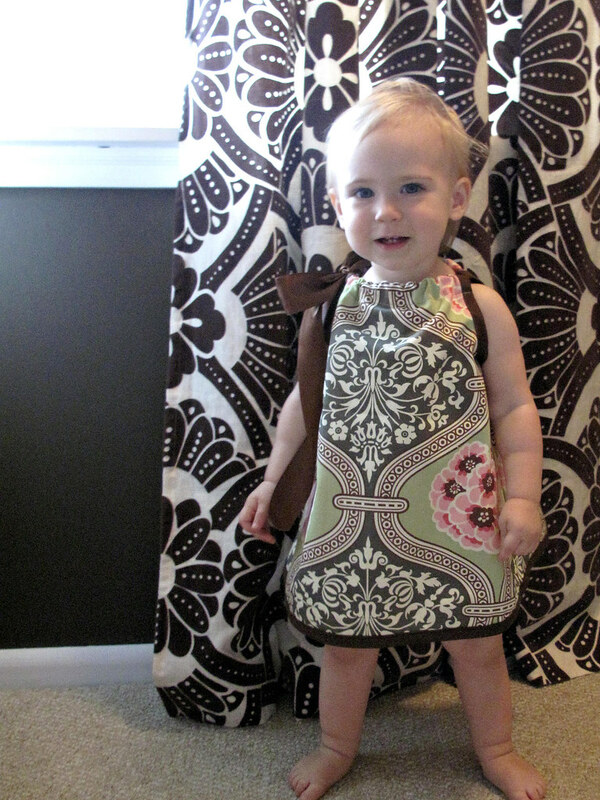 I made a pillowcase dress, following Jaime’s tutorial on Prudent Baby. I was going to make my own bias tape because Jacinda’s was so cute, but then I hesitated after realizing that it’s probably a huge pain to do without the proper doodad. Twitter confirmed my suspicions. So I went with the brown bias tape that I already had on hand, and some Amy Butler fabric that I bought for curtains but never used. The dress took me three hours from start to finish, but that is because I am most definitely a novice when it comes to sewing. It would probably only take an hour and a half, maybe two hours, for someone with more experience. The dress turned out nicely though. It’s so sweet! I’ll probably swap out the long satin ribbon for something a little more practical, but it was pretty for these photos. If you’d like to make a dress for a little girl but aren’t sure of your sewing abilities, I recommend making a pillowcase dress. The trickiest part was attaching the bias tape to the arm holes, but if you can handle that the rest is easy. And it’s so cute. I want to make a million more. This is so professional-looking and cute to boot– bravo! Ok, that dress is SO cute. And your daughter! Oh my goodness she is the sweetest! SO cute! I’m a sewing novice like you and this I just might be able to tackle. Thanks for the inspiration! I love how she’s posing in front of the curtains, the fabric has been given new life! That is so cute! I’d definitely bookmarking it for future (very far future!) use. Great job! I’ve also been procrastinating making bias tape, b/c there are more things that need my time right now. Oh good lord if that isn’t the cutest thing I’ve ever seen. Great job on the sewing! Oh my gosh, how adorable!! I absolutely love it (and the model is even more cute than the dress). Really adorable! My mom made a ton of my clothes when I was little and those are definitely the pieces that have the best memories. Absolutely adorable little dress! Looks so cute on her – great work! She looks so cute, and I love the fabric. Great job, Nicole! That turned out SO cute! 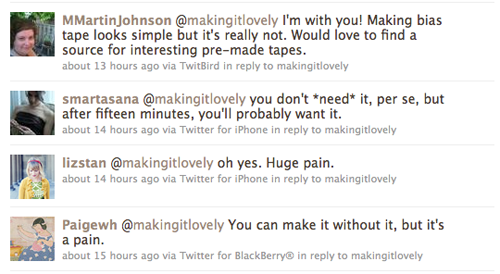 “Making it Lovely” for sure! Much nicer than the pillowcase dresses I’ve been making, I may need to change it up and use this tutorial instead! ADORABLE!! I can see this style in heavier fabric with a long sleeved shirt and leggings in the winter time! Eleanor is a great model. Good job, Momma! This is sooo adorable! my little girl is 10. I will have to pass this on to friends who have little-little girls! How cute!!! She’s such a sweetie! I just died from too much cute. Such a cute dress- love, love, love that print! That big shiny ribbon is just perfect! 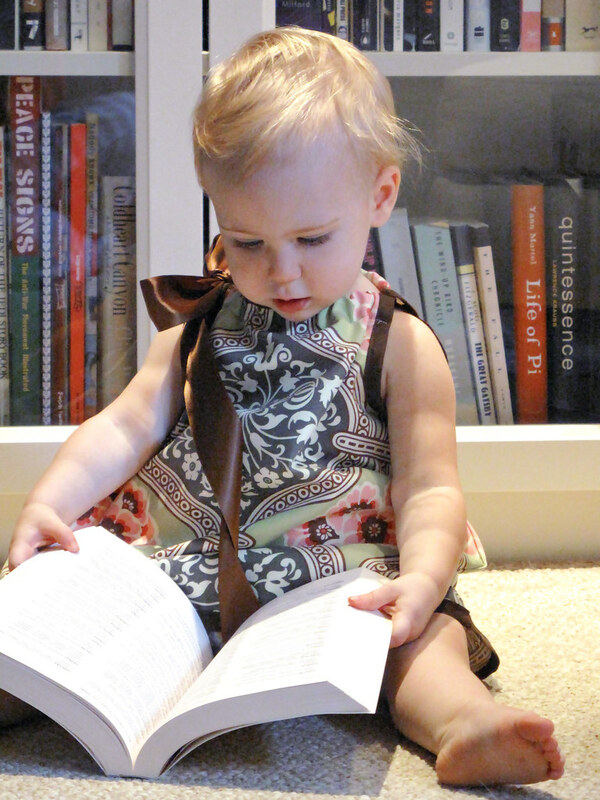 Nice work – love the dress and your precious little girl. So cute. Is a coordinating dress for mommy in the works too? The fabric looks so great on Eleanor. She’s so blonde! That dress is adorable! You did a great job! oh my! 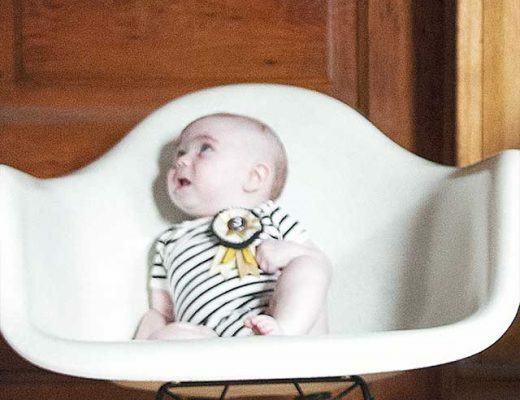 one of my FAVORITE amy butler patterns..this dress is sooo cute..and eleanor makes even cuter! her little face is just soo precious! Do you remember the name of that fabric or know if it is still available. It is exactly what I’ve been looking for! I’ll purchase the remainder from you if its enough to make curtains from! Ha, I made my Button a pillow case dress as well. It was on my 30 before 30 list as well. Too fun! I love your pattern. 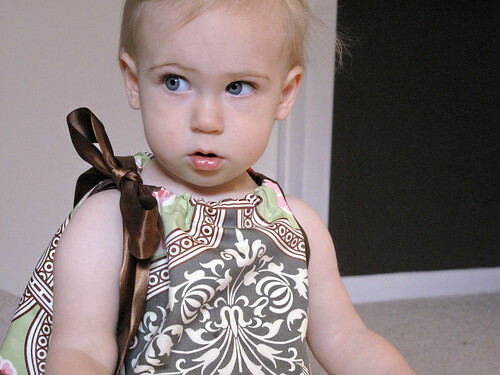 I posted a few photo’s of the dress I made for my little one on m y blog if you are interested. After doing that project for my girl, I’ve become inspired and am now starting on some fun curtains for her room. Adorable! I LOVE the fabric choice. You are the most creative person! Everything you touch is adorable!! go girl! That is beyond cute. It’s a smart shape for a girl’s dress- it’ll take her a while to grow out of it, and it would be easy to alter into a top if she did! You’re lucky to have such a photogenic little miss! So sweet. 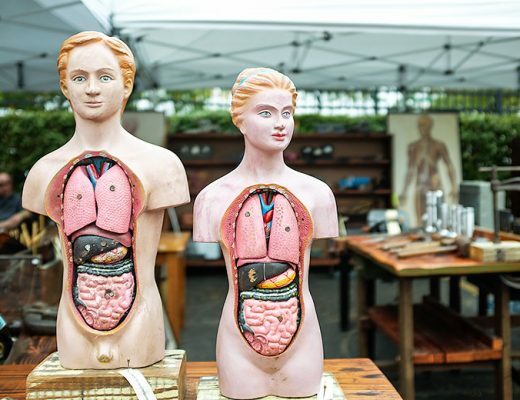 One of the best applications of Amy Butler I’ve seen. SO adorable!1 I love the ribbon – such a sweet little touch! super adorable. I just love it! I totally want to make a million of those dresses now! That fabric is so beautiful! the dress turned out really really well… Kudos to you! Oh how darling! If I had a little girl I would so MAKE this!! I love those curtains behind Eleanor (and of course her dress but don’t we all!). I’m sure you’ve mentioned it before and I just missed it but where did you get those curtains from? Awesome job – so cute! you inspire the hell out of me! oh my goodness. love the dress and the ‘side-eye pic! Good job. And she’s darn tootin’ cute too. Gorgeous dress on your gorgeous girl! I’m so inspired!! So, so, so cute! I love it and Eleanor is perfect model for your dress. I want a grown-up version. Absolutely gorgeous…both the dress and the baby! Love the brown & white curtain fabric on the window behind her. What is it? Her dress is adorable! Beautiful job, Nicole! So sweet! What CAN’T you do?? I can’t wait for Jaime to see your adorable creation when she gets home from a biz trip tomorrow! I so agree on the bias tape, there is a great handmade business in selling bias tape in pretty prints. What a lovely little pillowcase dress! It’s so fun to sew for little ones. I’ve been doing a bunch of dress sewing lately, inspired by Japanese sewing books and online tutorials. I have to say, I do make my own bias tape without that doodad thingie and I think it’s very easy (I used the doodad thing too, and found it more tedious). The important thing is to have a nice hot iron and a water sprayer. I also have sharp scissors and fold the fabric over a few times so I’m cutting just a short piece and when it unfolds it’s long and even. Now that I do it all the time I am entranced by the possibilities and feel I can make more creative fabric mixing choices! 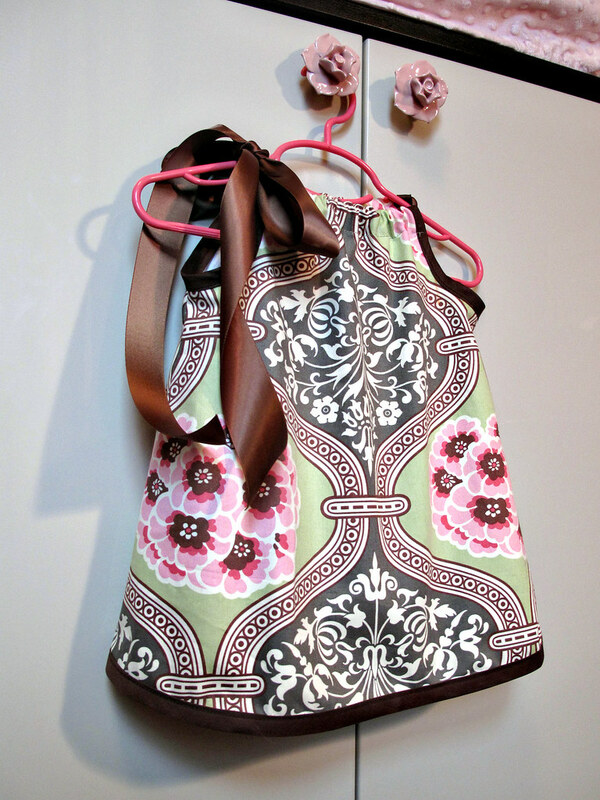 It’s also a great way to use up scrap fabric. Very very very very very cute! How cute is THIS! So adorable…she’s already more fashionable than I am and I’m 39…. Very very cute, such a stylish girl! Just worth mentioning though that the ribbon around the neck might be a bit dangerous, there are a lot of regulations out there now advising against any kind of ties around childrens necks as there is risk of strangulation…Not very nice I know, but worth bearing in mind. Love the fabric though! Bias tape isn’t as scary as it sounds. Here’s a good tutorial you should try and play around with when you have some extra time, because making your own gives you a lot more design options. My problem is not the time or desire to sew, but that I don’t have any cute little babies to make things for! I have a giant stash of adorable fabric I’m hoarding for my “future babies”…haha! it’s adorable, you did such a great job. it looks like the perfect style dress for this super hot summer we’ve been having. What a cute dress! I’ve been wanting to learn to sew and tackle some easy projects, but I can’t even decide on a machine to buy. What kind of machine do you have? I second Jessica J’s question. I’m having trouble deciding on a beginner sewing machine and keep finding mixed reviews. Any advice? Such a cute cute dress! I love the photo with the book. Congrats on marking another thing off your list! You inspired me to start my own list (I turn 30, 5 months from today!). My list is here http://alanandval.blogspot.com/2010/08/30-by-thirty-today-marks-5-months-until.html and I even mentioned you as my inspriation and linked to your blog. Hope you’ll take a look! Good luck on the rest of your list! Aww! She just gets cuter and cuter! She shows so much more of her personality as she gets older. Oh–and the dress is lovely. I want to make some for my nieces. Could be a pretty christmas gift… Thank you! I love to make bias tape. It’s a very calming job to do when I have lots on my brain but want to still be in the sewing room. Please consider contacting me if you would like custom bias tape made for your next project. You can either direct me to the fabric you want me to zip together or send me the fabric you have on hand. HEY!!!!! what a treat to get home from a trip and see this! your dress turned out sooo gorgeous! this is SO CUTE!!!! I love the big brown ribbon!!! Dress is adorable, but I also love the curtains. Did you purchase the fabric and make them or were you able to buy the curtains somewhere…most know! Would it be wrong to size this up and make it for, say, a 37 year old? Any little girl would look dreamy in that! Such an adorable dress! Eleanor looks just like you, so cute! Great job. That is the cutest pillowcase dress I’ve ever seen! Great job sewing it:) Love reading about your 30 before 30, it’s inspiring! That is the most darling thing ever. So creative and unique. Several sellers have really cute custom bias tape on Etsy if you want to add some detail to future dresses without the headache of producing your own. :) Adorable dress on an adorable baby girl! Oh my, it is so cute. And so is Eleanor. » Revisiting the 30 Before Thirty List Making it Lovely | Transforming the so-so. SELL these!! I’ve been following your site now for almost a year and LOVE every little sweet creative touch you add to your home and loved ones! GREAT JOB–seriously! sell them! This dress is adorable! I wish I could sew and that I had a little girl to make one for.